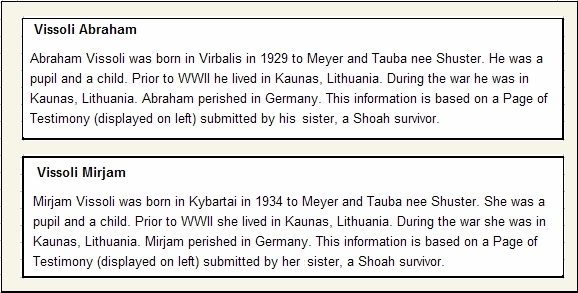 I only knew that one daughter of my grandmother's sister Taube, called Bluma, survived the holocaust. 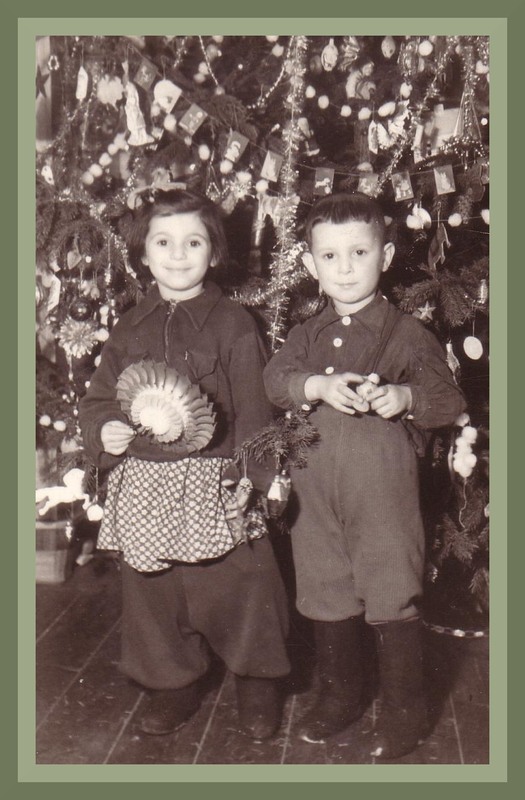 My aunt Nelly told me that they were living in Kaunas and the last they heard about her cousin, was that when she was about 16 years old (during WW2nd), she was in a summer camp near the Russian frontier. Immediately after the invasion started, one of the guides of that camp, took all the Jewish kids using a train, deep inside Russia (The Ural Mountains), and by doing so, he saved their lives. Never was it more prophetic an intuition as she was the only survivor of her family of eleven. The guide visited Israel a few years ago and received the Righteous Among the Nations Badge in "Yad Vashem". Bluma also participated in a documentary film in connection to that story. Note 1: I will do my best to try and find out this documentary. Note 2: I have the last letter Bluma received from her mom, just a few days before the Germans came. It's written in Yiddish and an old neighbor of 85 years old was kind enough to translate it for me. Then, when starting the "Shuster Connection", one more data arrived. One of the cousins from Canada had been in Israel and met her: she did not remember the address, but remembered that she was married to a Schlomo Baron. With that small clue, I started again to try to find her. I do have a Jewish girlfriend in Argentine and when talking to her about the subject, she told me that she had a girlfriend in Israel, and she will be very glad to help me from there. I did write to my friend’s friend Clary, and sent her a photo of Taube. I never know how did she manage to find her, but the 9th of December 2004, Clary's husband, named Reuben, wrote to me telling me that they finally (it took them several months) were able to find a 79 years old person with that name and according with the data they exchanged, she was our Blumale. The rest is history. I was able to communicate with her grandson Ori and then when Ori and brother Amit came to South America in their sabbatical year (September 2006), we met personally. And I am pretty sure that it was a great happiness for Bluma, to know that her family in Uruguay knew about her and remembered her. Bluma passed away the 4th of September 2005. Note: I have to thanks Ori, for forwarding me all the information of their branch. 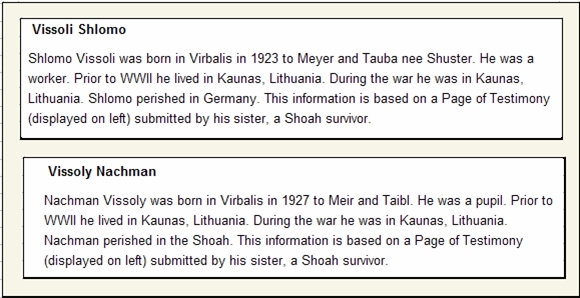 I got to know data about Taube and Tzadik whereabouts in the saddest way. 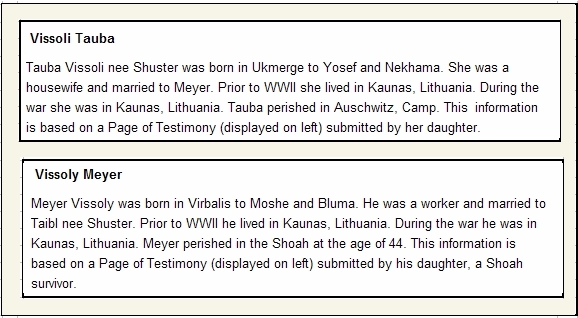 I was checking data on the Internet when I came across the claims that Bluma Baron had made in 1988 to Yad Vashem trying to find her family (our family). She submitted 34 requests. Taube branch, click to enlarge. The second of 7 siblings, Taube was born in Ukmergé, Lithuania, in August 1900. She was married to Barnik and pregnant when the Bolsheviks came into town and killed her husband. She hid in a fireplace to save her life. Sarah Heina, her first child was born in 1917. 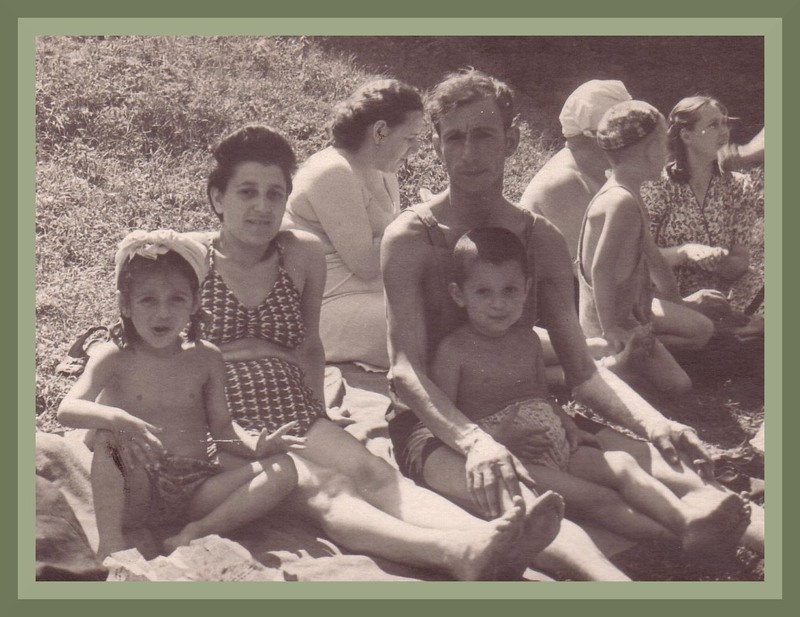 They were living in Kaunas when WW2 started and all of them were victims of the Nazis but for Bluma, that was at the summer camp. 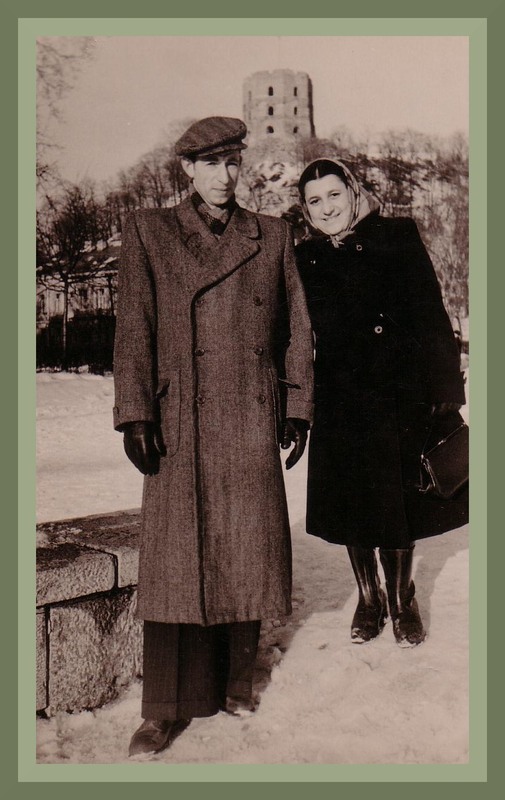 Taube's eldest children, Sarah Henia were married to Yekhezkel Dalon, born in Kybartai in 1917 and they had a baby girl, Slava, born in Kaunas in 1939. 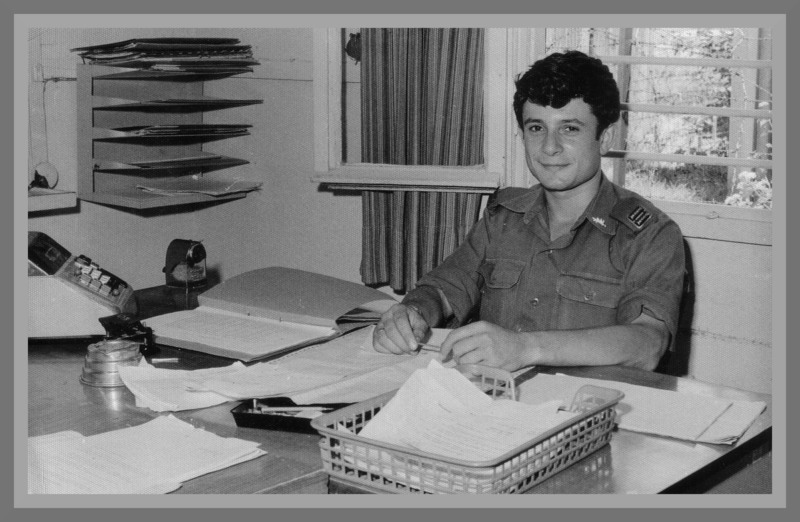 Yehuda Meir Vissoly Cohen was a volunteer in the local fire brigade. 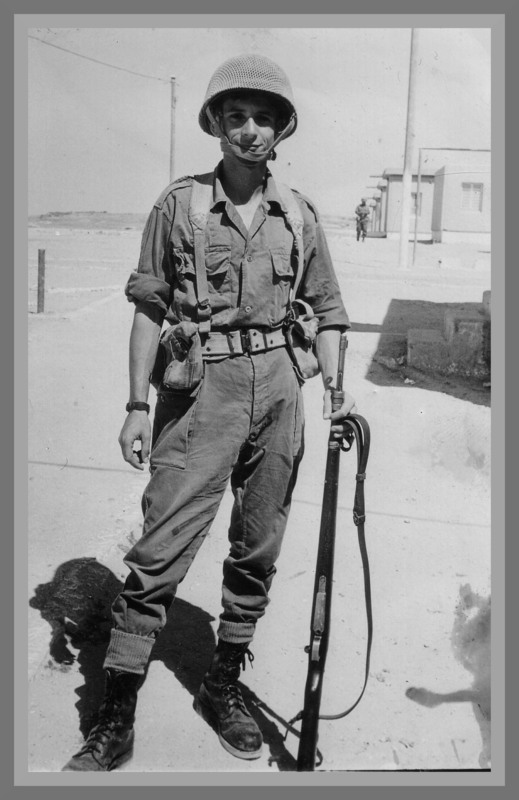 After the war, Bluma came back to look for her family and found the following photo in a local shop. Her father Yehuda is located in the second row, between the kid and the lamp. Vilkaviskis, Kybartai and Virbalis, click to enlarge. Vilkaviskis district is in the southwest of Lithuania. There are three towns: Vilkaviskis, Kybartai and Virbalis. Virbalis can be found on the main road stretching from Kaunas to East Prussia, about 60 miles Southwest of Kaunas and 3 miles away from the former German border and the railway station with the same name (now Kybartai) which is on the railway route from St.Petersburg to Berlin. During World War I the town burnt down and was deserted by the majority of its population. With the establishment of the Lithuanian State in 1918, Virbalis citizens began to return to their town. Old rail Station at Kibart. According to the first census conducted by the Lithuanian Government in 1923 there were 4,018 people in Virbaln, among them 1,233 Jews (31%). The town had 5 Jewish grocery shops, 7 butchers, 6 bakeries, 3 shops for tools and iron products, shoemakers, 4 tailors, 2 glaziers, 2 tinsmiths, 2 hairdressers, 2 tombstone builders, 2 watchmakers 1 photographer and one tavern owned by Jews. With the beginning of the Nazi rule in 1933 in Germany, many Jews left Virbaln, in particular the youth. Most of them moved to Kovno and a part immigrated abroad, or to Eretz-Israel. During this period Kybartai was situated on the Russian (Lithuanian) side of the border with Germany (East Prussia). The small stream Liepona – its width was only 4 to 5 meters (about 13 to 16 feet) - was the border between the Empires of Russia and Germany before World War I. Five passenger trains passed through the station with hundreds of passengers and every day in both directions two cargo trains. In 1880 the Jewish Community obtained permission to open a Jewish Elementary School. Many Kibart Jews were mentioned in lists of donors for the "Settlement of Eretz-Israel" of the years 1898-1899. At the end of the nineteenth and at the beginning of the twentieth century many Russian Jews who lived in the "Thum haMoshav" (the special zones were Jews were allowed to live) immigrated to the USA. For many years the Kybartai community remained linked with the nearby community in Wirballen (Virbalis), being under its rabbinical jurisdiction, and using the same cemetery. On the night of Thursday, September 11, 1941 (the 19th of Elul 5701) Lithuanians arrived in carts and ordered all the women and children to the anti-tank trenches where they cruelly murdered all. Of all the Jewish Community of Virbalis only three women hidden by Lithuanian families managed to survive. Such was the tragic end of the thriving Jewish Community of Virbalis that existed for more than 300 years. Beginning in March 1942, a wave of mass murder swept across Europe. During the next 11 months 4,500,000 human beings were eliminated. 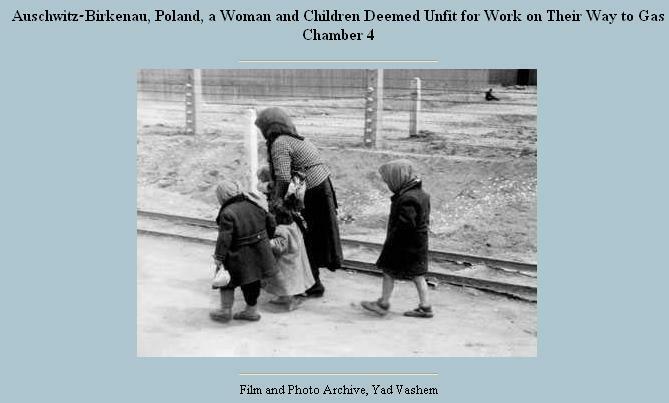 By the end of World War II the toll had risen to approximately 6,000,000 Jews, which included 1,500,000 children, who perished at the hands of the Nazi murderers. From the first days of their rule, the Nazis began setting up concentration camps and using them as a tool with which to suppress political opponents and sectors of society viewed as undesirable. The Nazis used the camps as a tool for implementing their racist policy in the lands they had occupied. Most of the victims of the Holocaust were murdered by the Nazis in the gas chambers in six extermination centers set up for this purpose. The largest extermination camp of all, where the Nazis murdered one million Jews from all over Europe, Auschwitz has become a symbol of terror, genocide, and the Holocaust. It was established in 1940. One of the lesser-known concentration camps, was the first one created by the Nazis outside the country of Germany in 1939. It is located in the eastern suburbs of Gdansk, Poland (formerly Danzig). The following are the findings published by Yad Vashem, the The Central Database of Shoah Victims' Names. They collected and recorded the names and biographical details of half of the six million Jews murdered by the Nazis and their accomplices. 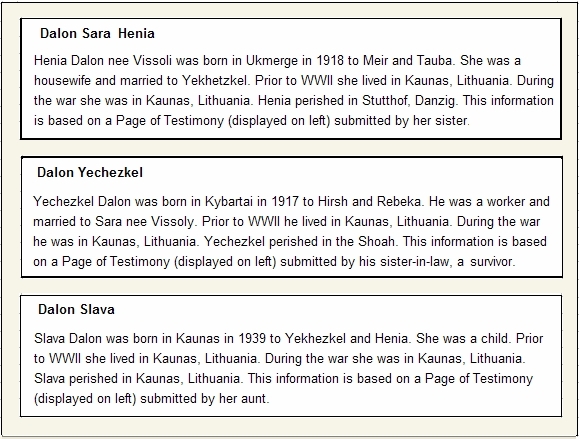 All of them were claimed by Cousin Bluma, the only survivor daughter of my grandmother's sister Taube. She claimed for 34 closer relatives murdered in the Holocaust. Her three brothers (Shlomo, Nachman and Josef Abraham) and sister Dina were murdered. Her stepsister Sara along with her husband Yekhezkel, baby girl Slava and in-laws Hirsh and Rivka were murdered. 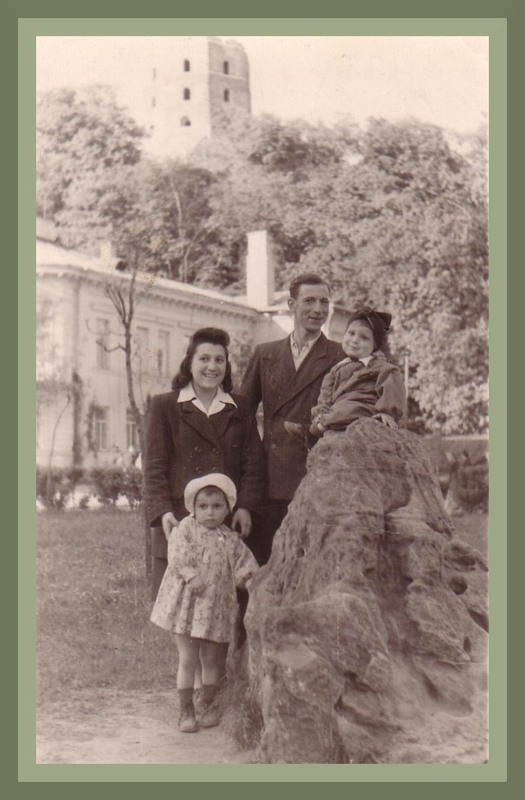 After the Nazis were defeated, the only surviving child of Taube, Bluma, returned to Lithuania and settled in Vilnius. There she met Schlomo Baron (Brun) and the 6th of November 1946 were married. 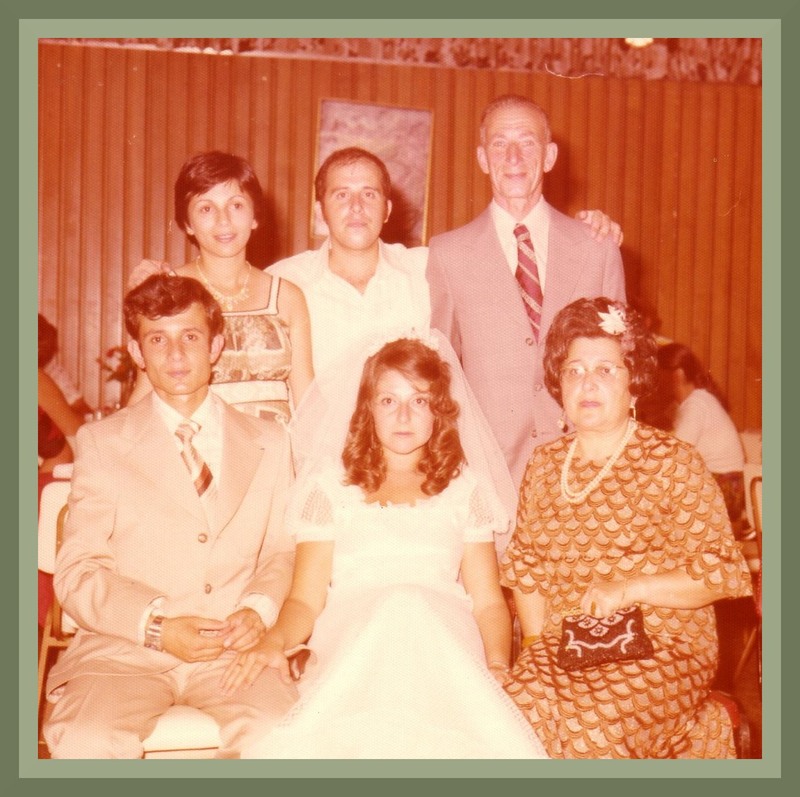 In 1971 the whole family migrated to Israel. 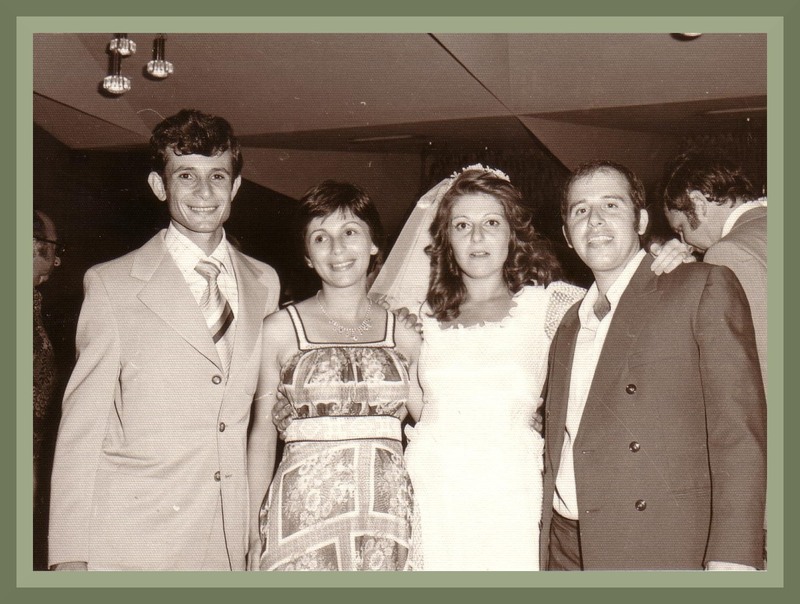 Hirsh Baron married Hanna Gurevitch (born the 27th of June 1955) the 14th of August 1975. They have three boys: Ori (born the 3rd of October 1978), Amit (born the 21st of February 1981 and Roy (born the 16th of October 1987). Taibe (Yona) Baron married Yaakov Zilberberg. 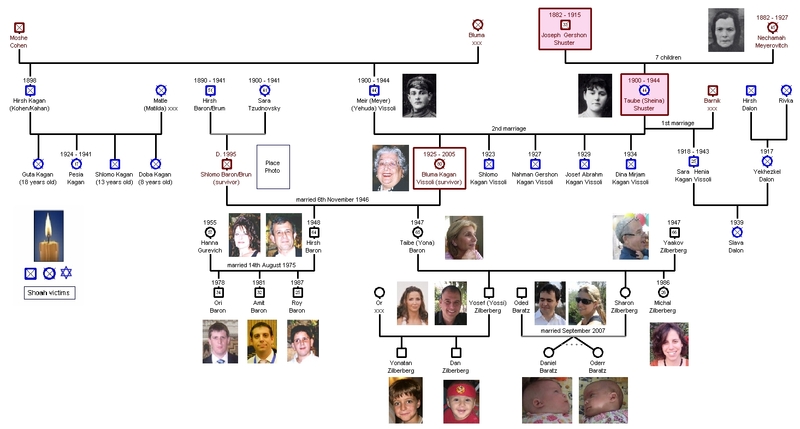 They have three children: Yosef (Yossi), Sharon and Michal. Yossi married Or in 2003 and an year later, their first son, Yonathan, was born. Sharon married Oded Baratz in September 2007. Note: More data and pictures will soon be added. Next year in Jerusalem !!! Believe it or not, last year (September 2006) we had the pleasure of receiving in our home two of Bluma's grandchildren), Ori and Amit Baron. They were touring South America and included a two day visit to Uruguay so we could get acquainted. 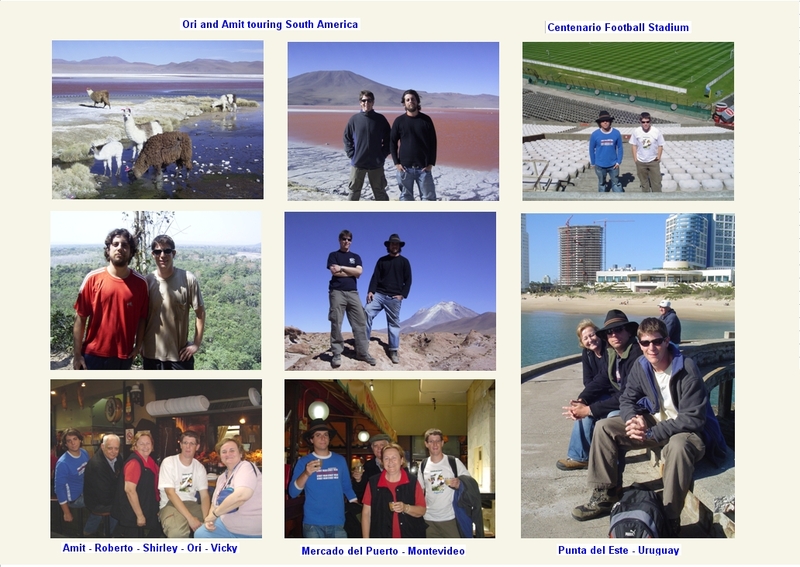 Before starting to work, brothers Ori and Amit decided to make a tour in South America. Maybe seeing some pics will make you feel like imitating them? And after finishing your tour, visiting us??? Tzadik branch, click to enlarge. He was the third child of the Shuster-Meyerovich's siblings. He was born in 1901,in Ukmergé, Lithuania. My aunt Nelly told me that his sister Rebeca, always remembered his as a youngster that loved to read, in an attic with the light of a candle. 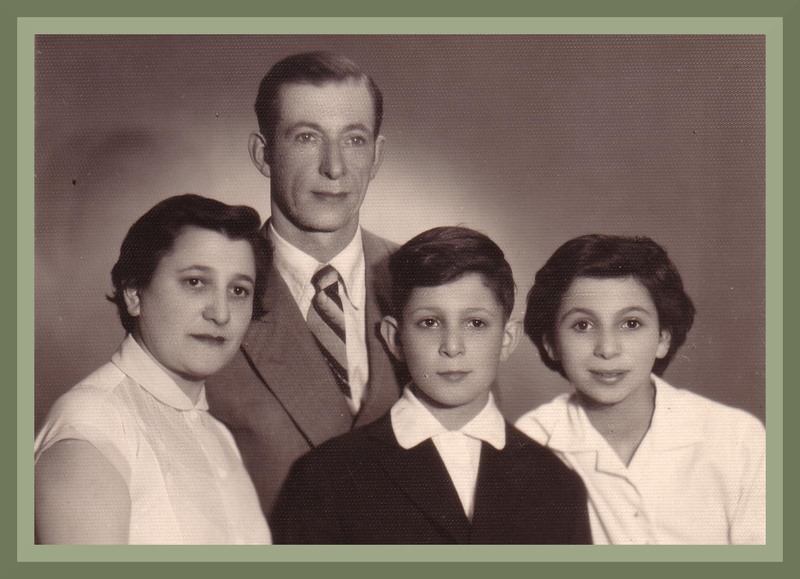 His older sister Sarah migrated in 1914 to Canada, and a year later his father Joseph Gershon passed away. Being the oldest boy (his sister Taube was a year older than him and the other boy, Meyarke was only 6 years old), his father commended to him to take care of his siblings and gave him his golden watch as a present. We know that he was married to Khana and had 8 children, twins among them. During the war, the place of residence of all the family was Kaunas. It is believed that all of them perished in the Holocaust but for a son named Berkel that later migrated to Israel. 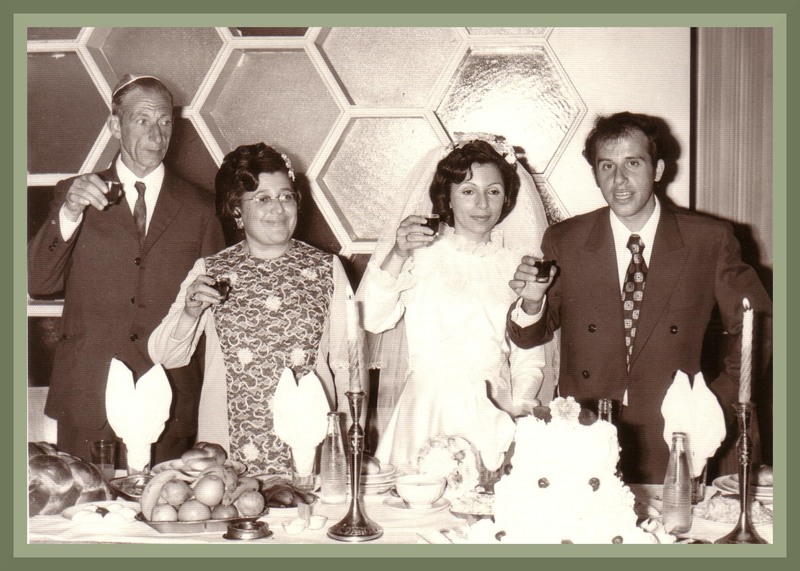 The only data I have is that Berkel married and had two daughters: Hanna and Karen and they live in Herzliya, Israel. All attempts to get in touch with them have not been successful so far. When their cousins from Israel visited us last year (Bluma's grandchildren) I requested them to find any available address. They sent me the address of Hanna, the only problem is the barrier language: she speaks Hebrew, Yiddish and Russian and I speak Spanish, English and French (but at home I also have help with Italian, Portuguese, and a little Greek and Arabic). 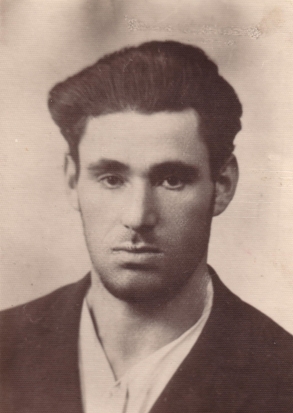 According to "JewishGen" list of "Jewish Survivors from East European towns-Kovno", there was a Shuster, Berel, our Berkel. Because of the data gathered, we now know the names of three of his children: two boys named Nakhum and Gershon and a girl named Dvora. We still have to find what happened with the other 4 siblings as well as their mother Khana. Note: They have not been claimed by Bluma, what makes me think they were survivors as well as her. Unfortunately Bluma has passed away and there is no way to know: just to continue searching for them in the hope one day we will find them or their descendants. The following are the findings published by Yad Vashem, the The Central Database of Shoah Victims' Names. They collected and recorded the names and biographical details of half of the six million Jews murdered by the Nazis and their accomplices All of them were claimed by Cousin Bluma Baron (nee Vissoli), the only survivor (daughter of my grandmother's sister Taube). 34 of her closest relatives were murdered in the Holocaust. Her niece tried to find her uncle Tzadik and her cousins Nahum, Hershon and Dvora. What happened with Tzadik’s wife as well as his other children? 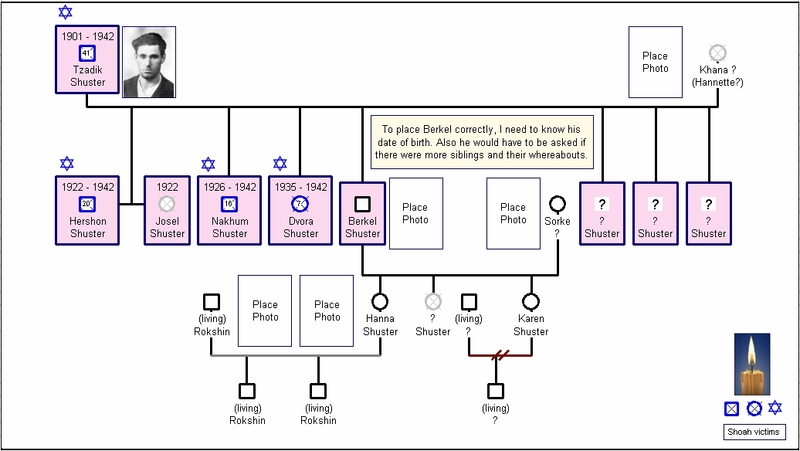 My auntie Nelly remembers that her mother told her about twins (one called Hershon and the other called Josel-named after their grandfather Joseph Gershon Shuster), aand also that Tzadik had eight children (data that is not confirmed so far). Note:: Other cousins had not been claimed by Bluma, what makes me think that maybe they survive. Unfortunately Bluma passed away and there is no way to know: just to continue searching for them in the hope that one day we will find them or their descendants.